Ballinger Campground is located in Ventura and Santa Barbara Counties approximately fifteen miles southeast of New Cuyama, CA, off of Highway 33 on Ballinger Canyon Road (9N10). Ballinger Canyon Road is paved to the campground entrance only; the entire campground area is dirt. The campground sits at approximately 3,200 feet in the eastern foothills of the Cuyama Valley. The surrounding vegetation is considered high desert with large Juniper bushes and other smaller brush and shrub species. The primary use of Ballinger Campground is as a staging area/campground for OHV riders. 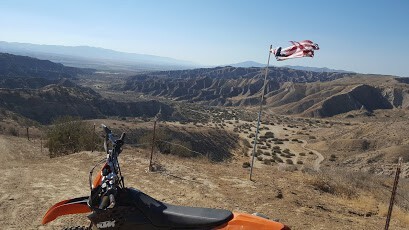 Ballinger Canyon and the adjacent Deer Park Canyon are the largest contiguous OHV riding area on the Los Padres National Forest. The Ballinger/Deer Park area has approximately 70 miles of 4X4, motorcycle and ATV designated routes within its boundaries. During hunting season, hunters frequent the Deer Park Canyon Area in search of quail. Most users come from the Los Angeles Basin, Santa Maria area and southern San Joaquin Valley. The campground contains 13 family sites. The forest has new tables and accessible fire rings to be installed in this facility, but they have not yet been installed. There are two trash bins at the entrance. Water is not available or provided at the campground. There are two, double-riser concrete cinder-block vault toilets and two single-riser wooden vault toilets at the site. A large loading and unloading dock is located in the campground for riders use. Due to the open nature of the campground, campers that come as a group to recreate together tend to cluster and camp in groups around campsite facilities. There are plans to install a beginner’s riding area within the campground boundary at the far eastern end in the future. As the temperatures cool, the recreation use increases. The maximum use occurs on holidays and during the winter, spring and early summer months. Due to increased daytime temperatures in late summer (August and September) use decreases. The minimum operating season is year-round.